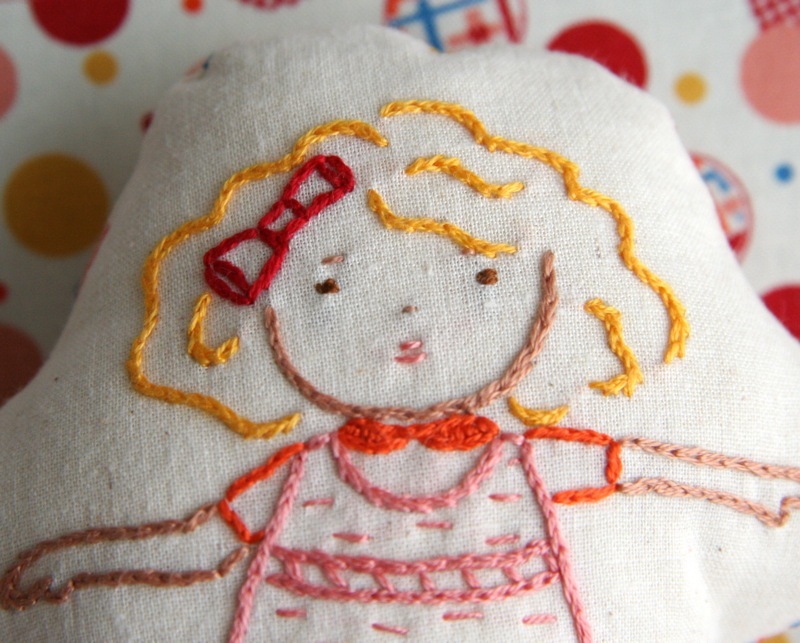 i love these embroidered dolls! great concept 🙂 it reminds me of the fabric cutout ones that my mom used to make for me. She is adorable! I love it and need to work on my embroidery skills! (and possibly spelling). I love the retro feel with the more modern sport! I was looking forward to seeing your last post come together. She is lovely! I so love all your embroidered girls! These are so awesome. I would love to make one for each of my little daughters. Any plans to make them a downladable template? How very rad! Love it. Great scrolldown payoff, Hillary- my first thought was “cute, roller skate embroidery!” but I adore the skateboard surprise! Wow! She is so cute! Would you ever make these into kits???? Fabulous. 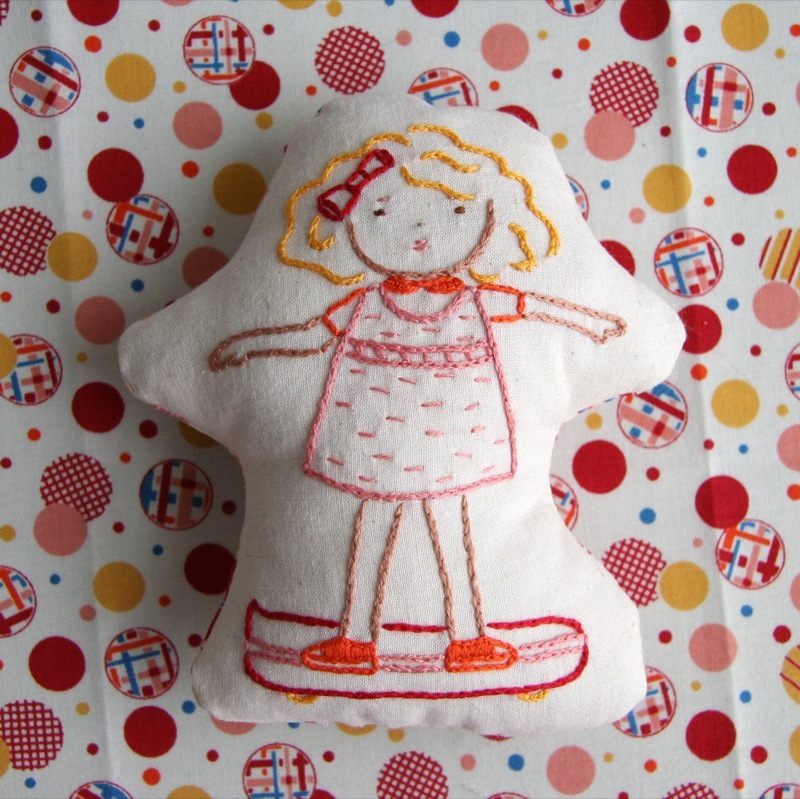 I’m loving these embroidered girls! How do you do such a neat chain-stitch? I just love these embroidered ladies, they are so cute, I just learned how to do crewel, needle work is so much harder than it looks, at least at first! The stitching is impeccable! How do you do it? I think her arms are my favorite part. Lovely. I love your new embroidery work Hilary. I tape my drawn designs to a window and then tape the fabric on top, then I trace onto the fabric that way. It is a make-do light box, and technique I used all the time at art school. Very, very cool- Great job!! So so so super cute! Next time you better put a helmet on her. Hey, these are SO sweet! A thought on transfering designs–there’s a technique stamp carvers use to transfer a design to a block of carving material that MIGHT work with fabric. Worth a try. Take a sheet of vellum or tracing paper. Use it to trace your design. The softer/darker the pencil lead, the better. Now place it pencilled-side down on your fabric. Scratch the back (especially along your pencil tracing lines) with a fingernail. With a little luck, the penciling will transfer to the fabric. I absolutely adore this small “pillows” you are making lately, especially because they send me back almost 30 years, when my mom made me a heart shaped decortive pillow with a stiching just like these ones. I am from Portugal and if you would like I can send you a picture of it. I have just brought it from my parents house to give to my daughter (now 4). Keep up the lovely work.